It has certainly not been a happy Monday on the Nadia Khan Show as celebrity guest Meera created quite a bit of a scene on the set yesterday. 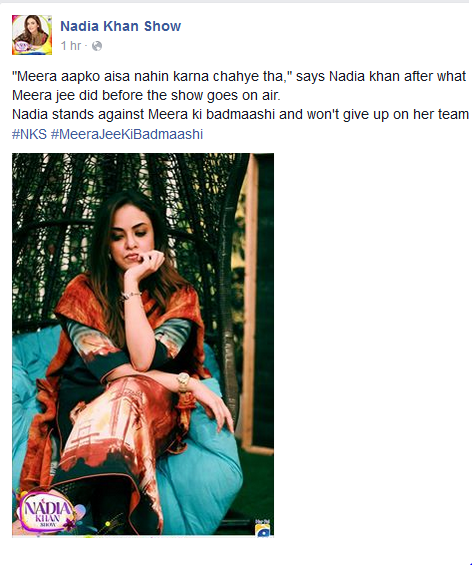 Nadia Khan started today’s episode talking about the absurd attitude of film star Meera. She was called on the set as a celebrity guest (as per her own wish), but she ended up creating havoc on the set. Instead of making an appearance on the set, Meera locked herself in a make-up room and refused to came out despite Nadia Khan’s constant requests. The host didn’t like it at all and openly expressed it in a Facebook status. According to our sources, when Meera reached the spot she was wearing sunglasses to cover up her swollen eyes and apparently not in her senses. Initially she had a quarrel with her manager who left the spot stating that he didn’t want to work with her anymore. “Mujhe kis dirty place per le aye ho”, shouted the actress while stepping out of the car. The sources on the set also added that the host Nadia Khan kept asking Meera to come out and explain everything as anyone can have a bad day, but the actress refused to budge. Meera stayed in Geo’s make-up room till 1pm and refused to give comments on the show. Meera even physically abused the show’s producer Noor-ul-Huda when she contacted her to sort the issue through talks. Mehwish Hayat To Be Awarded ‘Tamgha-e-Imtiaz’ on Pakistan Day! Rohail Hyatt Returns To Coke Studio After 5 Years! Junoon Reunites After 13 Years! Copyright © 2019 PMC Media Group.